For the sixth year, the Side By Side film festival is offering Russians the chance to learn about and discuss LGBT issues. 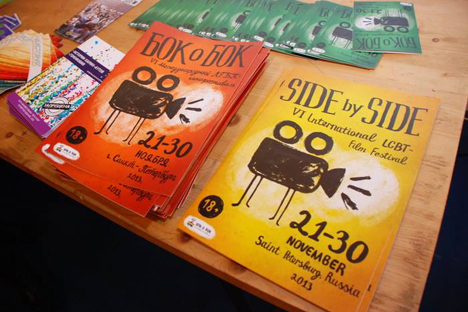 Despite the ongoing debate over Russia’s anti-gay propaganda law, the VI International LGBT Film Festival "Side by Side" is currently taking place in St. Petersburg. The very fact of its existence is an indication that Russians are interested in learning about and discussing LGBT issues. The festival includes films about homosexuality, bisexuality and transgenderism. The program includes 32 films, including 10 feature films and three collections of short films from winners and participants of the world's largest film festivals including Sundance, Cannes and Berlin. Such well-known directors including Diederik Ebbinge ("Matterhorn"), Martha Cunningham ("The Way of Saint Valentine"), Ed Wolfe ("We were here") attended the festival, as well as Gus Van Sant (“Milk”) who was the special guest of the festival. The festival also includes a screening of the film by French director Abdellatif Keshish "Life of Adele" which won "Palme d’Or" at the Cannes Film Festival. At the end of the festival, the jury will award prizes in several categories as well as a special award for the protection of LGBT rights in Russia. This year the festival was subjected to increased scrutiny. This year, St. Petersburg city duma deputy Vitaly Milonov demanded the revocation of distribution certificate for a number of films because they "violate the principles of social morality and ethics.” His assistant, Anatoliy Artyukh got in a fight with a gay activist and on Nov. 23, there was an attempt to interrupt the festival with a bomb threat. In June, the organization behind "Side by Side" was recognized as a "foreign agent" and fined of 500,000 rubles but on Oct. 9 the City Court of Petersburg overruled the lower court and allowed the festival to continue with a payment of a fine. More information about the festival can be found at its official website. Films are showing through Nov. 30. This story was based on reporting from Gazeta.ru and Grani.ru.